Continuing worries over mounting US debt are fueling concerns in Cambodia that a fall in the value of the dollar could lead to rising im­port costs and a further hike to inflation. Lawmakers in the US are currently in talks to pass a deficit-cutting deal before Aug 2, a deadline when the US reaches its debt ceiling of $14.3 trillion. If no agreement is made, the US would de­fault on its debt, and the US dollar would likely depreciate fast. That possibility, however unlikely, is turning heads in Cambodia. Economists and investors, speaking yesterday at a conference in Phnom Penh, said that a default or even a downgrading of US debt by credit rating agencies could have negative repercussions in Cambodia’s dollarized economy. “If they [the US] can’t resolve their problems and they get downgraded it would result most likely in a sharp fall in the United States dollar. In Cambodia if you are an exporter and you operate in US dollars here that would be very good news,” Stephen Higgins, CEO of ANZ Royal Bank, told the conference. A weak dollar is of particular concern in Cambodia due to the fact it is a net importer. Last year total imports to Cambodia reached $6.8 billion compared to $5.2 billion in exports. Debt worries in Europe – Greece cannot repay its debt and is being bailed out by other European countries, and fears are mounting over public debt levels in Ireland, Italy, Portugal and Spain – could also have a impact on garment factories here that are dependent on demand from EU member countries. “Those are the two things in Europe and the US that worry me. As does inflation,” he said. Over the past year imports costs have already been creeping up in Cambodia. The US dollar has fallen by 10 percent to $1.42 against the Euro over the last 12 months. It has also fallen by 4.6 percent to 0.15493 against the Renminbi, China’s currency, over the same period. And in May, year-on-year inflation in Cambodia reached 6.5 percent, the highest level in 14 months. Some relief to the figures comes in GDP growth, which is estimated by the government to be 6 percent this year. Mr Higgins yesterday said it would more likely reach more than 7 percent as both domestic and foreign investment continues to grow. Nevertheless, Mr Higgins is not the only one who fears a weakening US dollar. Importers are also wary. Economists say the likelihood that the US dollar continues to fall and threaten Cambodia’s economy is very real. “This is a definite possibility because most of our products supplied here in the country are imported. 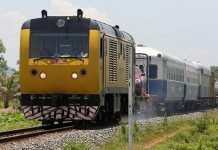 Every product is calculated in US dollars,” said Kang Chandararot, president of the Cambodian Institute for Development Study, adding that Cambodia is currently importing goods from countries with stronger currencies. 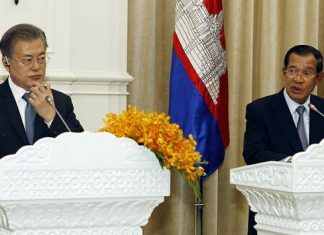 Chinese exports to Cambodia, for example, increased by 41.5 percent to $1.12 billion in 2010 compared to the previous year. 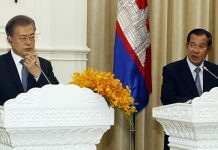 Mr Chandararot said that there was little sign that the dollar would recover any time soon and that the need for Cambodia to de-dollarize was now becoming more evident. “The situation in the US economy doesn’t reveal any strong confidence yet,” he said. A report released in June by Cambodia Capital, a local investment consultancy firm, noted the risks associated with Cambodia’s reliance on the US dollar. “Cambodia is a dollarized economy, with around 90 percent of transactions taking place in the US currency, and therefore the country does not have recourse to monetary policy and is very exposed to an depreciation in the US dollar,” the report stated. During yesterday’s conference in Phnom Penh, Sophina Khiev, markets manager at ANZ Royal, made a case against using US dollars to import goods into Cambodia. He said that using the Renminbi to import goods to Cambodia would be more cost effective with the confidence in the US dollar being so low. “China no longer pegs the Yuan to the US dollar and is in the process of appreciating,” he said.